Starring Charlton Heston, Roddy McDowall, Kim Hunter, Maurice Evans, James Whitmore, James Daly, Linda Harrison. Stanley Kubrick's 2001: A Space Odyssey is now acknowledged as the science fiction film of the 1960s, the experimental epic that changed the genre. Another Sci-Fi thriller opening almost at the same time was a much bigger popular success. Fox's Planet of the Apes came out wide in April of 1968 and was still playing as a second feature when we went back to school in September. 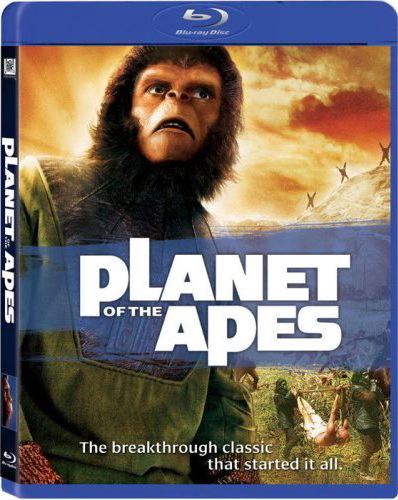 Unlike the intellectual movie with the puzzling "giant space baby", Planet of the Apes connected with audiences on an intellectual and an emotional level. Not since Forbidden Planet had Hollywood made a major movie about exploring an alien planet. Rod Serling and Michael Wilson's screenplay overturns expectations from the very beginning, when the female astronaut set up to be Charlton Heston's love interest fails to make it through the first scene. The three earthmen never get a chance to point ray guns at alien monsters -- before they've barely caught their breath, they're prisoners of a topsy-turvy society that switches the roles of man and monkey in the evolutionary pecking order. What follows is a brilliant mix of realism and farce, as Planet of the Apes sidesteps audience derision by providing its own jokes. Heston's George Taylor comes upon the local humans, mute and ragged, foraging like sheep, and figures that he'll be running things in less than a year. Just ten minutes later, they're practically wiped out by the actual dominant species on this new world. Wounded and silenced, Taylor watches dumbfounded as screenwriters Rod Serling and Michael Wilson show us a barbaric inversion of our own society, reworked to place monkeys in control. Their society has class divisions based on species, with lighter Orangutans on a higher level than Chimpanzees, and the darker gorillas relegated to menial work. The government is a theocracy that will not tolerate science that challenges official dogma. The existence of Taylor, a talking man, is a threat to the authoritarian Dr. Zaius (Maurice Evans), who has been suppressing the archeological work of Chimpanzee Cornelius (Roddy McDowall) because his findings contradict religious texts. Taylor not only challenges Zaius's status quo, he fulfills a dread holy prophecy that a New Man will come and destroy ape civilization. Audiences were fascinated by John Chambers' clever ape make-ups, which transform noted actors Evans, McDowall, Kim Hunter and James Whitmore completely yet permit a wide range of facial expression. The apes become angry, laugh out loud and kiss one another. We accept them as characters interacting with Charlton Heston. As for the man who played Moses, this "lowly" science fiction film is actually one of his best. An expert at humanizing one-dimensional epics, Heston recites mouthfuls of exposition in a way that makes us listen to every word. He communicates vulnerability, desperation and humiliation even in long shot. He holds our attention even when surrounded by fascinating monkey-men. It's tempting to assign Apes' mischievous humor to Rod Serling and its political agenda to the once-blacklisted Michael Wilson. Groucho Marx made fun of allegories but the film's satiric camouflage allows the liberal writers to lead a general audience to consider controversial subject matter. Planet of the Apes champions evolution over creationism and dismisses Church doctrine as superstitious nonsense. The keeper of the faith is a full-blown hypocrite whose primary motivation is retaining power. Or so it seems. Taylor befriends the Chimpanzees McDowall and Hunter; both actors are extremely effective under their simian muzzles. The lone earthman finds a possible mate in Nova (Linda Harrison) and with the help of his new friends avoids the vivisectionist's scalpel, not to mention an appointment to be gelded. Taylor's a very interesting survivor. Unlike his fellow astronauts, he's a loner cynic who doesn't like civilization. He seems not the least upset to be cut off from Earth, never to return. Taylor believes in self-reliance. He's a fighter, and more than a little arrogant. Planet of the Apes is a movie of the 60s, when film companies had no reason to fear liberal messages. Serling and Wilson seize the opportunity to put the naked Taylor on trial before a society determined to prove that he doesn't exist. In a combination McCarthy witch hunt and Scopes Monkey Trial, Taylor is officially "disposed of." It's all very much like Joseph Losey, Bertolt Brecht and Charles Laughton's notorious production of Galileo, a late 1940s theater piece aimed squarely at the evil of blacklisting. The satirical "funny monkey" context allows Apes to pursue political issues far more "dangerous" than Dr. Strangelove's atom war theme. Everybody's against nuclear war, but few other mainstream movies (besides Inherit the Wind) so openly challenged the existence of God. Allegory was the perfect format for TV's The Twilight Zone, where each episode would end with Rod Serling's God-like voice delivering his liberal "Author's Message". Moviegoers expect more, and Planet of the Apes scores as Sci-Fi, adventure and light comedy, punctuated by two or three jolting scares. The saving grace of Serling and Wilson's didacticism is that they don't claim the final victory for the liberalim. Zaius is a functional hypocrite, yes, but it turns out that he's acting in good faith to forestall a terrible fate. In the key scene, Zaius has a private conversation with Taylor in which he makes his fears brutally plain. He wants Taylor eradicated because Man by his very nature is naturally evil: arrogant, violent, destructive. And he's right. Zaius plays dirty and hides behind a show trial because he fears what Taylor represents -- humans destroyed their own world and are perfectly capable of doing the same to the Ape planet. Planet of the Apes may be more accessible than 2001 but just because its messages are obvious doesn't mean that they've been "dumbed down". Reviewers picked up on the Rod Serling / Twilight Zone connection, with the result that people normally discussing John Wayne or Julie Andrews were suddenly talking about Planet of the Apes in connection with evolution, the space race, and civil rights. This was 1968, when it seemed the whole country was aflame with race riots, and national leaders were being assassinated left and right. Discussing Planet of the Apes at the dinner table was an acceptable way of addressing real issues. No other "lowly science fiction movie" had quite the same impact. Fox's Blu-ray of Planet of the Apes will thrill fans of the popular Sci-Fi franchise. Producer Arthur P. Jacobs dragged the concept on for four sequels, advancing the story to Armageddon and then backtracking into time travel stories and budget-challenged battle epics. This first chapter holds up as great filmmaking, demonstrating director Franklin Schaffner's flair for efficient visual storytelling and cameraman Leon Shamroy's excellent lighting. The desert landscape around Lake Powell never looked so alien, and marvelous sets on the Malibu Ranch (we keep expecting helicopters from M*A*S*H to fly by) create a convincing simian culture. Schaffner's action direction is nothing less than brilliant, perhaps because of his and Charlton Heston's previous experience together on the impressive medieval epic The War Lord. The Blu-ray looks very much like the latest DVD special edition, with colors brought back almost all the way to normal from slightly faded original elements. Faces can seem too light sometimes; otherwise the presentation is a visual beauty. Grain in opticals is still apparent but the optical schmutz in the opening spacecraft scenes (with the traveling-matte 'space lights' seen through the cockpit canopy) is completely gone. Likewise the famous ending shot, an extreme optical zoom, looks better than ever before. The audio is exceptional, providing a fine showcase for Jerry Goldsmith's eccentric score, with its strange sound effects incorporated into the composition. The extras replicate the long list of early special edition items. One commentary combines comments by Roddy McDowall, Kim Hunter, Natalie Trundy, and makeup artist John Chambers. Jerry Goldsmith has a second commentary all to himself. Author Eric Greene is on a special text commentary. The entire list of extras is below. The first new extra is an annoying but brief speech by a CGI-generated "The Lawgiver", which precedes the feature presentation. He doesn't sound like John Huston. Two new docus have been produced in HD. The Impact of the Apes interviews fans of the movie, most of whom were too young to have seen it new in theaters (where I can report every line and moment that elicited audience approval and applause). For many kids of the early 1970s, the Apes movies were their first exposure to key sci-fi themes like time travel, post-apocalyptic worlds, mutants, alternate futures, etc. The Evolution of the Apes gets off to a promising start by investigating the backgrounds of the writers and producer. It doesn't try to sort Rod Serling's input from Michael Wilson's, but it looks as though Serling's script called for the apes to live in a world as developed as ours, and was completely rewritten by Wilson to take place in a more primitive setting. The movie identifies The King Brothers as holders of an early option on the Pierre Boulle novel. It slams them as makers of "cheap crime and monster movies" -- like the expensive, well-regarded Gorgo, and imagines an unmade cheap King Bros. Apes by showing a still from Fox's silly Gorilla at Large! Turning back to the finished film, the featurette then "praises" producer Arthur Jacobs by comparing him to the fictional Hollywood sleaze Sammy Glick, the despicable main character from Budd Schulberg's exposé novel What Makes Sammy Run? The featurette also indulges a lengthy tangent to tell a detailed history of the Fox studio, something that seems to happen too often on Fox docus. The best disc content remains the fascinating older featurette material on John Chambers' makeup, and the extensive galleries of ad materials. Supplements: Commentary by Actors Roddy McDowall, Kim Hunter and Natalie Trundy, and Makeup Artist John Chambers. Commentary by Composer Jerry Goldsmith. Text Commentary by Eric Greene, Author of Planet of the Apes as American Myth. Adventure Game Beyond the Forbidden Zone. HD Featurettes The Evolution of the Apes, The Impact of the Apes. SD Documentary Behind the Planet of the Apes. ARCHIVES: Original Makeup Test with Edward G. Robinson, Roddy McDowall's On-Set Footage, Dailies and Outtakes, N.A.T.O Presentation, Original Featurette, Teaser Trailer, Theatrical Trailer. GALLERIES: The Ape Newspaper, Interactive Pressbook, Advertising, Lobby Cards, Makeup, Costume Design Sketches, Props, Behind-the-Scenes stills. See the Savant Main Page for more exclusive reviews.